Core team members are responsible for implementing the Coral Triangle Transboundary and Transformational Strategies. They collaborate as a team to progress the programme overall. Jackie Thomas brings years of conservation experience in the Pacific region to the Coral Triangle programme. In 2003, she joined the Australian Volunteers International Programme and was posted as Conservation Manager for WWF in the Solomon Islands until June 2005. Following that, she was interim Country Programme Manager of WWF Solomon Islands from March 2007 until the end of 2008, when she joined the Coral Triangle Programme in November as the Pacific Policy Officer based in WWF’s Pacific office in Fiji. Jackie moved into the position of Deputy Leader in 2011 and in January 2014, she became the leader of the Coral Triangle Programme. Jackie is an experienced programme manager, with a background in policy and advocacy, regional development, marine conservation, strategic planning, communications, and media. Through her engagement with the Coral Triangle Initiative on Coral Reefs, Fisheries and Food Security (CTI-CFF), Jackie has developed an understanding of natural resource management and sustainable economic development issues affecting the Coral Triangle and Pacific Islands region and gained cross-cultural experiences through work in the Pacific and South East Asia programmes. Prior to joining WWF, she worked in regional development for 12 years as a Project Manager and Export Trade Advisor for the Mid West Development Commission (MWDC), a Western Australian government statutory authority. Other roles throughout her career include being a journalist/newsreader with the Australian Broadcasting Corporation, and three years as Senior Public Relations and Communications Officer for a Western Australian mining company. What is WWF doing for policy improvements in the Coral Triangle? "We must continue to work together - communities, governments, civil society and the private sector to look after this amazing marine biodiversity hotspot so that it continues to nurture us and our future generations." Geoffrey has accumulated more than a decade of experience working in fisheries and aquaculture sectors across the Asia-Pacific and joined WWF in 2008 as Strategy lead for the CTP Live Reef Food Fish Trade initiative. He now leads the seafood markets and private-sector engagement work of the CTP, addressing food security, livelihoods and responsible seafood production at a regional scale. Currently his main responsibility is overseeing the development of an Asia-Pacific regional seafood platform designed to provide leadership and promote a responsible seafood agenda across the spectrum of seafood enterprises. Geoffrey is active within the WWF Network promoting Standards and best-practice management approaches relevant to the needs of small-scale fishery and aquaculture enterprises to enhance and improve their performance, as well as the role of rights-based management and sustainable financing to achieve conservation outcomes. He has been an author or co-author on numerous reports, scientific publications and peer reviewed papers on seafood supply chains, food security and livelihoods, markets and trade, EAFM and aquaculture and speaks regularly at forums and conferences around the Asia-Pacific region. Geoffrey studied at the University of Tasmania and Queensland University before receiving his Ph.D. in Fisheries Economics from James Cook University. "In fisheries today, change is essential and improvement is the only rational form of change." Keith Symington joined the WWF Coral Triangle Programme as Bycatch Strategy Leader and helped deliver both fisheries reform and species conservation outcomes. He has since moved to becoming the Programme Coordinator for Fisheries Improvement Projects, particularly looking into the handline and longline harvest of Yellowfin tuna in Vietnam, working closely with WWF Vietnam. Keith comes from WWF’s Greater Mekong Programme, where he led the development of the marine and fisheries programme in Vietnam from 2004. He helped develop Vietnam's first ever bycatch observer program, developing direct industry and government partnerships on circle hook trials and tuna policy work. Keith also helped develop Marine Stewardship Council (MSC) in Vietnam, working with market actors to improve market linkages, building key constituencies and cultivating industry-led initiatives. Keith worked in Pacific Canada on marine and fisheries management, including acting as lead NGO representative at Integrated Groundfish Management and Rockfish Conservation Strategy technical planning tables. He also co-chaired the marine conservation sector's representation and input into the MSC processes on salmon and Pacific halibut. 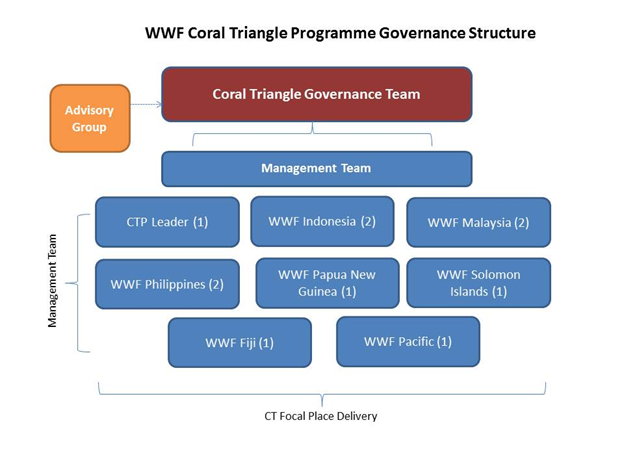 The Governance Team consists of senior executives drawn from a cross-section of disciplines (conservation, operations, communications, and marketing) from the principal WWF offices that provide financial support to and/or implementing programmatic and policy activities within the Coral Triangle Programme. The Governance Team ensures that the programme delivers on its overall strategic objectives by facilitating fundraising progress led by the programme leader.